From the leader in industrial hand protection comes the Hex1® Series, because we know that not all jobs require heavy-duty safety gloves. 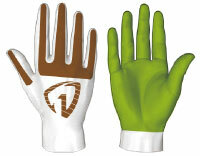 Sometimes you just need a pair of gloves that look great, feel great, work great and last. Hex1® gloves are made with the same high-quality materials as our high-performance safety gloves and perform better than any mechanic’s glove you’ve ever worn. Whether you’re looking for impact protection, wet or dry grip, cold weather or simply a shop-glove, you’re sure to find a Hex1® to fit your needs.